If your player is sitting home for the winter break just dying to get out and get some swings in - THIS is the camp for your kids! 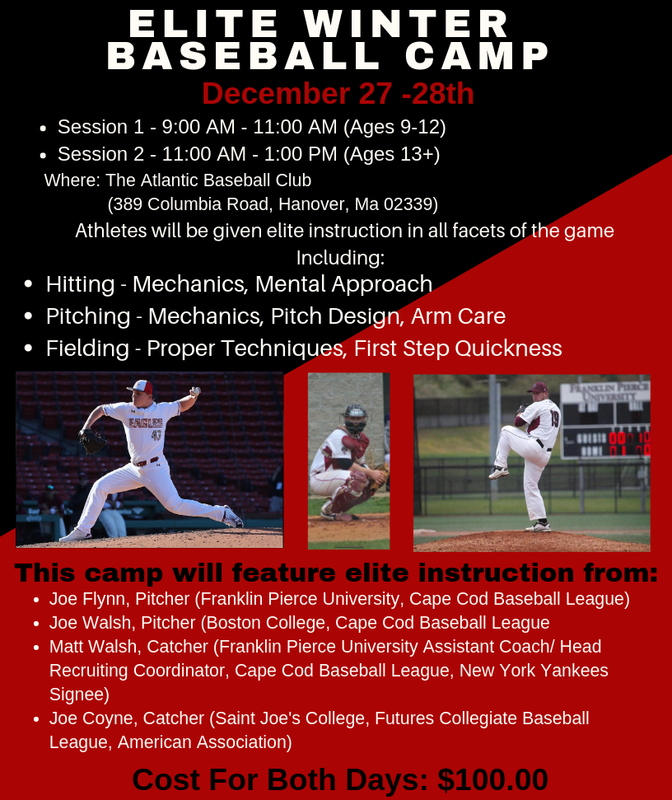 Hosted by former Plymouth North stars Matty Walsh, Joey Flynn, and current Boston College and Cape Cod League star Joe Walsh - the trio will run your player through hitting, pitching, and fielding mechanics they all learned as pros. Local star players giving back at a fraction of the price of most winter clinics a short ride away in Pembroke, MA at the indoor Atlantic Baseball Club facility. Check out the flyer attached and contact Atlantic Baseball Club and ask for Frank for more information. PS - for you aspiring catchers - Joe Coyne (St. Joe's College, Maine) will also be an instructor and Joe and Matt (Franklin Pierce, Pilgrims, NY Yankees) both played into professional programs as a catcher and can certainly help you work on your craft. Or - if your mind is already made up - Click Here To Register!